Usually the excuse "nothing is working" is used by finance professionals when begging clients not to pull their money, desperate to explain woeful performance and when there are no other explanations left. Only in 2018, that excuse is actually spot on. After another abysmal day for stocks, in which stocks suddenly "waterfalled" due to coordinated CTA liquidations once the S&P500 breached its 200DMA, which saw both the S&P and the Dow turn to just positive for the year, the broader market suffered one of its worst, if relatively muted, sessions in the past three years. As a result, market statisticians continue to fall over each other to describe the pain being felt across asset classes. And while it is customary to use the phrase "since Lehman" when in need of a blanket synonym for "dreadful", one analyst framed performance in 2018 differently: things haven’t been this bad since Richard Nixon’s presidency. As Bloomberg notes, Ned Davis Research - which groups various asset classes into eight big buckets, from bonds to US and international stocks to commodities- finds that not a single one of them is on track to post a return this year of more than 5%, a phenomenon last observed in 1972, according to Ed Clissold, a strategist at the firm. 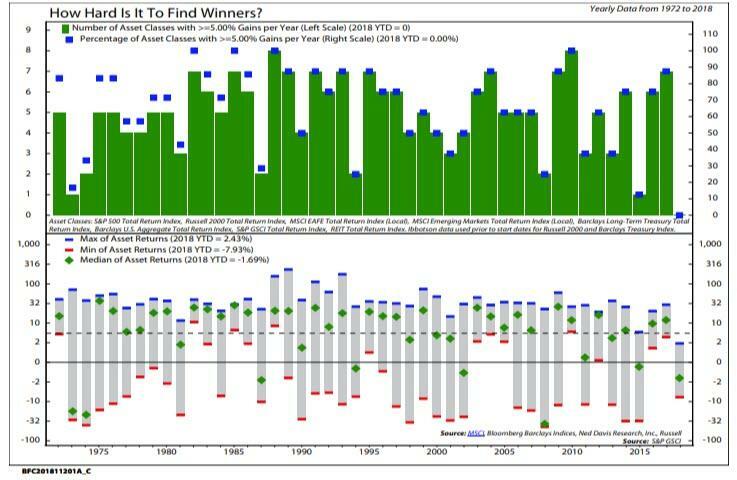 A similar analysis which we flagged two weeks ago, showed that the year-to-date return of the "best" performing asset between US and global equities, corporate bonds, Treasuries, gold and real cash, was barely in the green, and which showed that 2018 was shaping up as a disastrous year for cross-asset investors, in which not a single asset managed to generate positive returns! 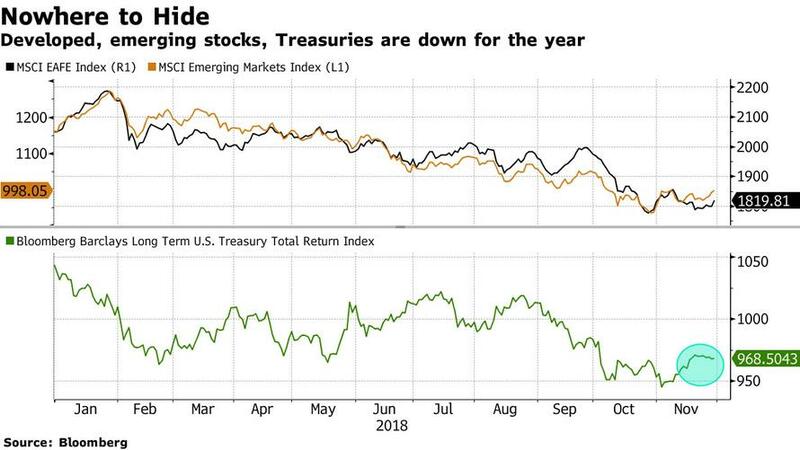 Nothing’s working, not large or small-cap stocks in the U.S., not international or emerging equities, not Treasuries, investment-grade bonds, commodities or real estate. Most of them are down, and the ones that are up are doing so by percentages in the low single-digits. The silver lining, as Bloomberg notes, is that in terms of losses investors have seen far worse. But what is shocking is the lack of gains, and if going by the breadth of assets failing to deliver upside, "2018 is starting to look historic." Such a uniform underperformance by all assets is unique in history, because when "something falls, something else gains. Amid the financial catastrophe of 2008, Treasuries rallied. In 1974, commodities were a bright spot. In 2002, it was REITs." Yet, in 2018, there’s nowhere to run. 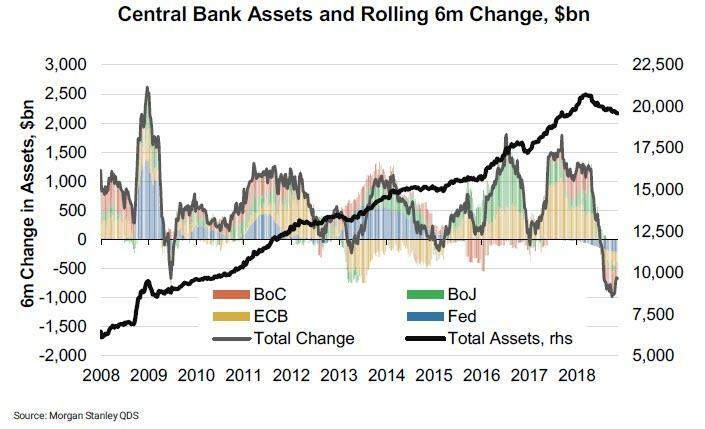 Confirming that the shrinking global central bank balance sheet will present a continued overhang to risk assets is the market action observed just this week when optimism over a temporary trade-war truce between the U.S. and China proved short-lived as concerns from Brexit to a flattening yield curve to a global growth slowdown exploded on Tuesday when the S&P 500 posted its fifth drop of more than 3% this year. The bottom line: with less than three full weeks of trading days left, the S&P 500 is up just 1% for the year and U.S. investment-grade debt has lost 1.6%, developing-nation stocks have dropped 12%, and the Bloomberg Barclays Long Term U.S. Treasury Total Return Index is down 6.4%.